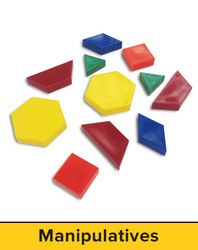 Designed for individual student use, the Individual Manipulative Kit contains the most common manipulatives used in the classroom. They help students develop key mathematical concepts and support differentiated instructional objectives. Includes handy storage box for easy classroom use. Kit includes: Two-Color Counters (20); Pattern Blocks (36); Student Clock (1); Connecting Cubes (50); Red Number Cube (1); Blue Number Cube (1); Attribute Blocks (60); Base Ten Blocks: Flats, Rods, Units (31); $1.00 Bills (10); Coins: Half-Dollars; Quarters; Dimes; Nickels; Pennies (56); Fraction Circles (51); and Flexible Ruler (1).